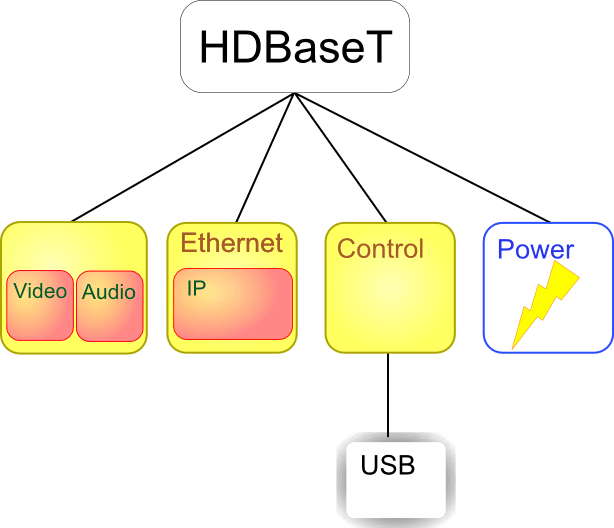 HDBaseT is a recently announced alternative way to connect home entertainment devices such as TVs and Blu-ray players. The primary intention of the new standard is to replace existing standards such as HDMI, DiiVa, and Display Port, in addition to superseding analogue technologies such as VGA and SCART. As such a proposition like this would have some pretty good advantages over its competitors – and it does! With the prospect of far longer cable runs and reduced cost of supply and installation due the ubiquity of the cabling standard the stand looks as though it will be very interesting indeed. So why did I feel the need to write this? Well because there wasn’t much information available and as such this will only just be speculation on my part. Why speculate in the first place? The main reason being this is exciting and I doubt it would harm anything or be counter productive to discuss what the new standard might be like. Finally what on what authority are you suggesting what you do? OK I’ll admit many people may not think I’m qualified to make such guesses essentially but most of what I’ll put forward was from reading between the lines of what we know combined with my knowledge of equivalent technologies and what I would suspect to be the simplest way to implement the promised features. What do we know so far? I’ll start with possibly the most exciting part of the specification, there are other great possible features though so don’t worry. Firstly it uses bog standard Cat5e or Cat6 networking cable with RJ45 jacks and all. This is possibly the biggest attraction of the new format. Being able to use existing ubiquitous cables to connect devices and existing cable installations to connect rooms is very attractive. The people who install home entertainment systems often get frustrated by the fact the cannot terminate expensive cables on location and are usually restricted to fixed lengths which aren’t very long. Cat5e/6 cable has always bee easy to run exact lengths and terminating as required. Did I say the working group promises that the usual 100m cable length limit will still be possible with HDBaseT? This all sounds very exciting especially when you throw internet, control signals and even power into the very same cable. So I’ll be able to use my existing ethernet cables and existing ethernet wall sockets throughout my house but will I be able to use my existing switches? No. Probably not I predict. From what I read you won’t quite be able to use existing hardware. The problem is I think most switches are layer 2 or even layer 3 switches expecting IP over ethernet traffic. The penalty for the great speed over massive lengths compared to other standards is that it will almost certainly have a different physical layer (layer 1) and possibly Data Link Layer (layer 2) to accommodate uncompressed HD video along with everything else it offers. The plus side is that it will almost certainly be packet based and it will allow the encapsulation of ethernet packets. See my diagram for my suspected protocol layers layout. Simple diagram to show assumed network layers. I hope the diagram is fairly clear. Basically able to transfer different types of data, multiple streams of video and audio to combine to make 3D images for instance. The inclusion of ethernet packets allows for internet connectivity and control signals allow feedback to video sources to be able to rewind etc. it will also facilitate transmitting USB signals. Presumably there will also be some power provisioning protocol, likely based on PoE but the quoted figures for power supply are higher than those of the existing standard so some modification will be needed. One of the other benefits I mentioned earlier is that by this design the protocol would be modular allowing for easily extending adding new features. You will still of course be able to effectively network your devices together however. You will be able to link multiple sources to multiple screens with the ability to choose what you want to watch where you want to watch it throughout your house. This also includes the ability for a source to dynamically change to accepting another feed for instance a blu-ray player that is also a recorder. Below is an example of what I expect HDBaseT switches to look like. I expect it to have a range of ports to connect HDBaseT devices together. These will act just as the ports on ordinary switches directing traffic to the appropriate destination. The inclusion of an “Internet” port is so that consumers can plug a broadband router in and over which only ethernet traffic will be sent. I have illustrated an IEC power socket prominently on the front since the switches could be an appropriate point to inject the power into. It won’t only be low powered disc player that would be targeted with the PoE implementation, it is the end goal to be able to provide enough energy to power modern flat panel TVs for literally a one cable set up. I hope you have found my insights and conjectures interesting and would love to read comments on the subject.